When the government tried to re-create the Super-Soldier experiment, they turned to Otto Octavius and his genius protégé, Peter Parker, to create the ultimate super-human. Though Parker was killed in the resulting explosion, the subject clone, carrying Parker's DNA, emerged with ability to manipulate gravity at will. After General Thunderbolt, leader of the project who took the young clone under his wing, was shot and killed by a street thug, the clone learned that (come on, you know this part) with great power come great responsibility! And thus was born... Spider-Boy! This product of the Marvel/DC Amalgam crossovers used to be a DC Direct Superboy. 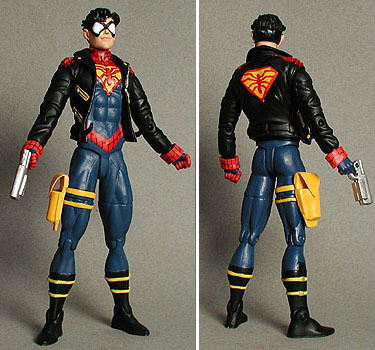 A combination of Spider-Man and Superboy, Spider Boy comes armed with his web-gun accessory and an attitude to match. This is a fairly easy custom to do and a great starter project for the "new-to-customs" guys out there. First, I mixed-up some resin and applied it to the face to build up the mask area over the eyes. Once that was dry (24 hours), I sanded down the eyes. I also cut off the extra belts and using a Dremmel, flattened those areas down. I then applied resin to smooth it over. Once that was dry (24 hours), I sanded down all the resined areas. Next, I looked for a holster and gun in my parts box and glued the holster to the thigh. I then cut some vinyl straps and glued those to the thigh to finish out the holster. I cut the handle off the gun and glued that to his left hand. This is about it for base work and now the figure is ready to paint. Next, I started painting the figure using Tamiya flat black, Tamiya flat blue, flat red and flat yellow + Tamiya flat flesh and flat white for the face. Using the comic book as reference, I painstakingly reproduced the emblem on the front and back of his costume. Once the painting was complete, I sealed the figure with Dullcote. The spiderwebs were done using a fine point black Sharpie. They're easier then they look.